These guys are awsome. This is my second time getting a rental from them. 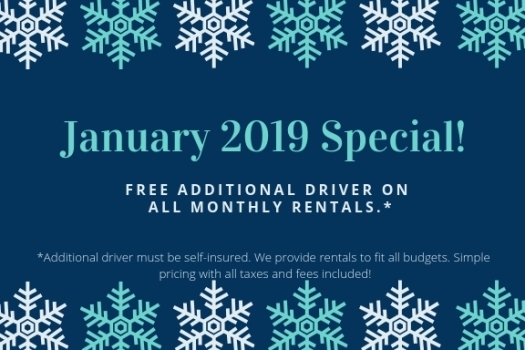 Monthly rental rates are affordable, and the office works with you if you need a little time with money for the next month. They are also quick to get you back on the road if you have any problems at all. I rented a car for over 3 months. In that time i needed the battery swapped out once. And then there was a leak another time, and I needed brakes changed another time. They got a tow out to me and gave me a loaner car until they fixed the car. Its great not having to worry about maintenance. All I had to do was call and say what was wrong and they handled it or sent me to the shop for maintenance. Im almost sad that my car is done being repaired because I will miss the customer service. I know i will use them again tho. Thaks guys for being so awsome.!! Sooooo glad I found this place! They specialize in long term rentals (minimum 7 days) and their prices are great! I called and was quoted a price by Diana for their red 2008 Chevy Impala. She sent pictures of the car and payment authorization via email. No deposit or credit card is required. My debit card was not charged until I picked up the car. When I picked up the car it was after hours, so the key was in a lockbox and the contract was in the car. The car's interior and exterior were both clean. The windshield fluid light was on as it was low, but thankfully I did not need to use it. Even though the car is 10 years old, it is clean and fully loaded with leather seats and a sunroof. There is no bluetooth or USB port. I had to purchase an iPhone charger for the cigarette lighter. The office is located around back of the strip mall. Just return your rental as you picked it up- gas, clean & washed. They do not provide transportation to/from the airport. Taxi is approximately $35 one way. This is your best bet if you require a rental for minimum 7 days. This is an amazing little company and you really get personal service. We had a minor issue with a car (check engine light came on, probably for no real reason) but she came and drove a new car out to our house and exchanged it on the spot with no hassle for us at all! Amazing! We kept the car a few extra days at a reasonable rate and had a very flexible and easy return. If I need a car like this again I will definitely be back. I chose this company for its unbeatable prices on longterm car rentals. The personal service was, unexpectedly, as good as I've gotten in any commercial transaction. Emil is a saint -- patient in explaining everything, and devoted to being helpful, flexible and dependable. He's the kind you root for in life, not just in business. Wow, best car rental experience I've ever had! Everything was so fast, no lines at checkin or checkout, no upselling. Emil runs this business so well and everything goes very smoothly. I always like the cars I rent from San Diego Car Rentals better than my own cars. I am a return customer, one can save a small fortune renting a used car. I consider Emil a friend after the professional, courteous way he runs his business. This business is the only way I am able to come to San Diego for extended periods. I had a reservation with a major rental company at the San Diego airport. Unfortunately I did not read fine print in the reservation, the major rental company had indicated would not accept debit cards to rent a vehicle. Was informed all major rental companies required major credit cards to rent a vehicle. I was totally stuck, lucky an employee of the major company provided the phone number of this "smaller" rental company. The manager was more than willing to use my debit card, staff were extremely friendly, helpful and professional. Will utilize this business next time I am in San Diego area. Emil and Diana are great! Emil has kept touch and gives great advice. They have the best deals in the state. Their deals are better than any service out there. Even better than those places that has cheap in their name. Their cars are pretty good and they ensure to keep steady communication with their customers. I'm glad that I ran across this company because they are a great business and actually care about their customers and the community. They truly have great prices and great cars. The offer regular vehicles and premium which are around 2018 Base models. They get a great amount of business because of their fair deals. I highly recommend that you book a reservation if you are in need of a vehicle because you can also rent monthly. They will be sure to help you. Check them out! Love these guys! Best price and service in town. We rented a white Mustang convertible. I recommend that you rent from them, I do for every trip to San Diego. Simply outstanding product and service. We were able to rent a great vehicle on short notice for 8 weeks for an intern who came in from New York. Price was outstanding, owner made pick up and drop off super simple. I would recommend this car rental service to everyone in San Diego that needs a reliable vehicle for an extended period of time....wow!!!! I've been a renting from San Diego Car Rentals for just over two years. My experience has been nothing but positive. The cars are always dependable, safe and extremely well maintained. It has been a pleasure doing business with Emil, who is very friendly, knowledgeable and always helpful. Fantastic experience renting from Emil and Diane at San Diego Car Rentals. I've recommended this place to all of my friends visiting the area. Over the summer, I needed a 1.5 month car rental. Emil's rates are extremely reasonable, and the cars he provides are in great shape. Emil was available to help us with any questions or concerns-- he would respond so quickly and always made sure everything with the rental was great. Besides that, Emil and Diane were always kind and friendly, making every step simple and easy. I will definitely be renting from them next time. You won't find a better place to do a long-term car rental! Emil is very professional and treats you like a life-long friend. Whenever I have a question or need assistance, he is quick to respond with helpful solutions. My experience with this company has been nothing shy of a five-star service. I once locked my keys in the rental, in the rain, with a dying phone -- Emil handled the situation so quickly and had help sent my way immediately to save the day! On top of great customer service, the pricing is so competitive. I feel lucky to have fallen into the hands of a company that actually cares for the customer. Thank you San Diego Car Rentals and to Emil for being so helpful! I have had the opportunity to rent a couple of times from San Diego Car Rentals. The best place for long term rentals. The cars are older but well maintained, the pricing is competitive. Emil and staff are great, professional and very customer service orientated. Rentals are fast, easy and flexible, something the National companies do not offer. I highly recommend them!